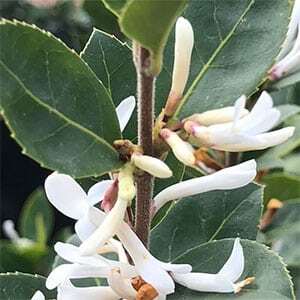 Osmanthus delavayi is an evergreen shrub grown for both the fragrant flowers and the attractive arching foliage. Flowering formulate winter to summer, the flowers are white, tubular with reflexed petals. The flowers appear as terminal clusters and have a sweet perfume, the fragranced is enhanced on warm spring days. It is easy to prune and can be used as a stand alone plant in the garden border, planted as a low hedging plant, or even used as a topiary specimen. Smaller growing forms such as O. delavayi ‘Heaven Scent’ are also available. A very low growing form is also available from some growers. As a hedge, plant at around 1 metre centres. This is an easy care plant in a well, drained humus rich soil. It grows well in full sun however in hot climates it will benefit from a little afternoon shade. Some additional moisture diring long dry periods may be needed. Regular tip pruning after flowering will help maintain a more bushy compact habit. Height – From 4 – 6 metres. Smaller forms are available. Flowers – White and perfumed. Flowering Time – Winter to Summer depending on variety.